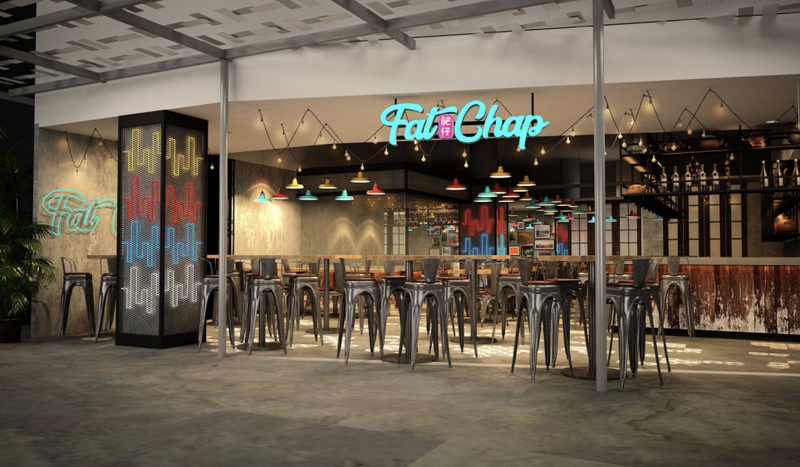 Fat Chap restaurant at Suntec bills itself as a place you go to “to get really full”. Well, I must say I did walk out quite stuffed indeed. It’s casual, bright and perfect for large groups and family gatherings. 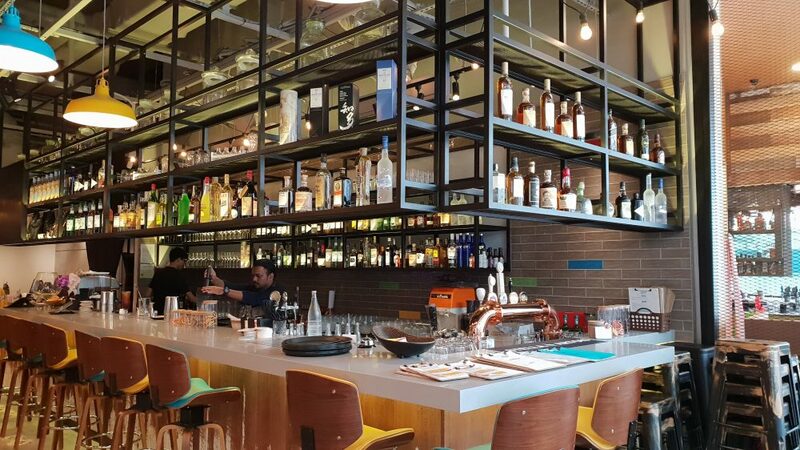 I’d probably generalize it as “Asian bistro cuisine” – you will see a wide range from Asam Pedas to Balinese Pork Ribs and even a Maggi Mee Goreng type of dish. 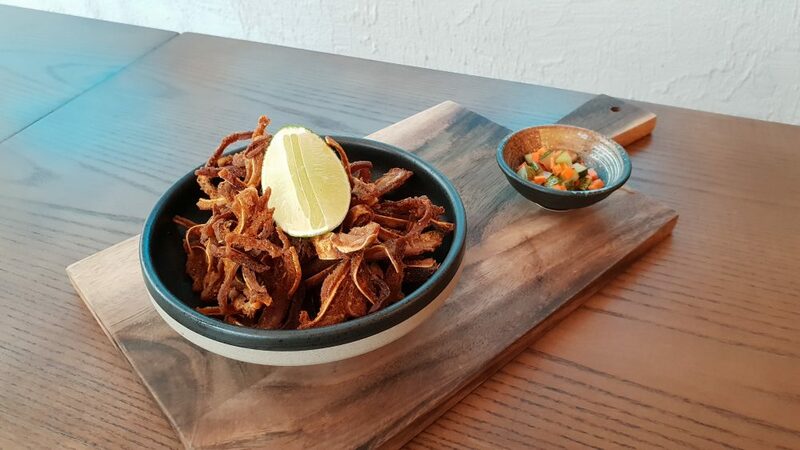 Crispy Pig’s Ear ($12) – the perfect snack to munch on with a beer or cocktail. Really addictive! 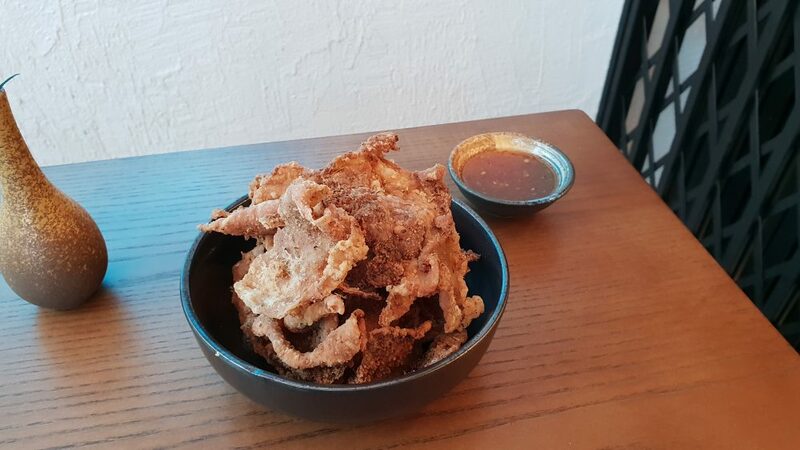 Crispy Chicken Skin ($8) – another option if the idea of munching on pig’s ears doesn’t appeal. That said, the flavour for this deep-fried dish was less compelling that the one from the previous dish. 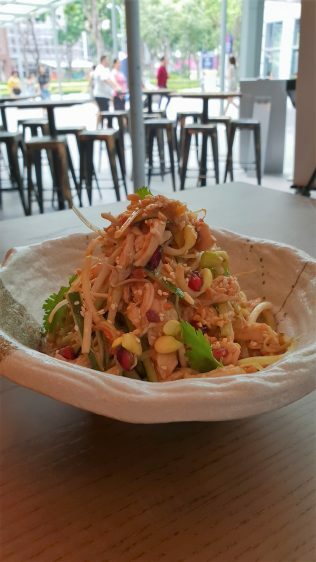 Pulled Chicken Salad ($14) – the Szechuan dressing has a light kick to it, not too spicy and the sous vide strips of chicken was very tender. 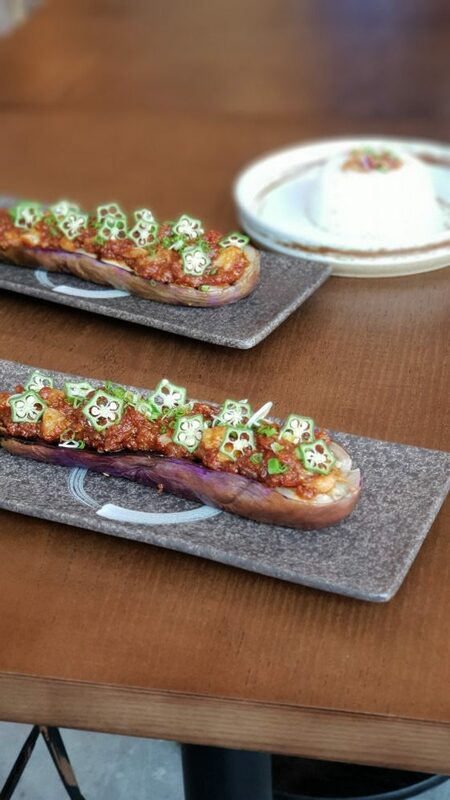 Eggplant ($8) – absolute must-try! What sounds like a really boring, humble dish on the menu turned out to be one of my favourites, thanks to the generous okra, shrimp, scallion, garlic and chilli “sambal”. 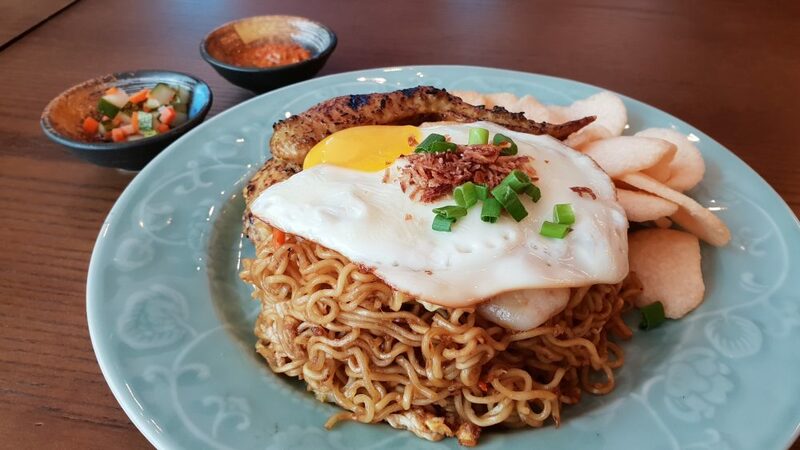 Bakmie Goreng ($15) – I know my blog’s name says I eat prata, but frankly, when I am at a prata place, it’s always the mee goreng that tickles my taste buds. So, you can guess it – I really enjoyed this mee goreng, it’s full-on with an egg, prawn, squid, chicken wing and prawn crackers. 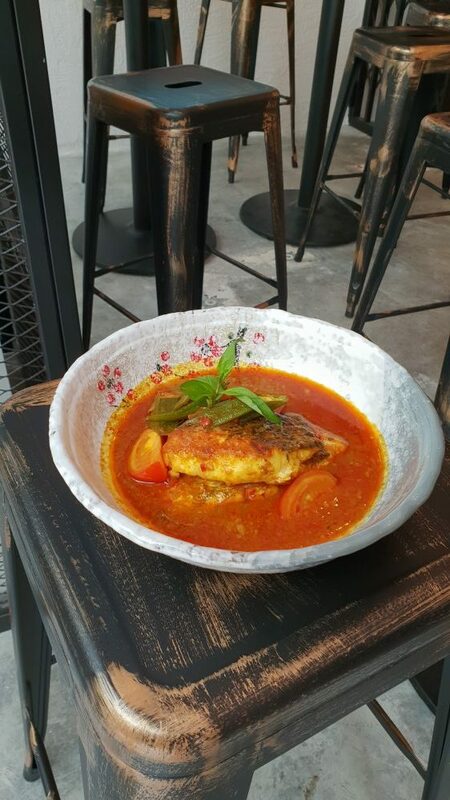 Asam Pedas ($19) – farmed golden snapper in a sweet and spicy sauce. Best eaten with steamed rice, of course. 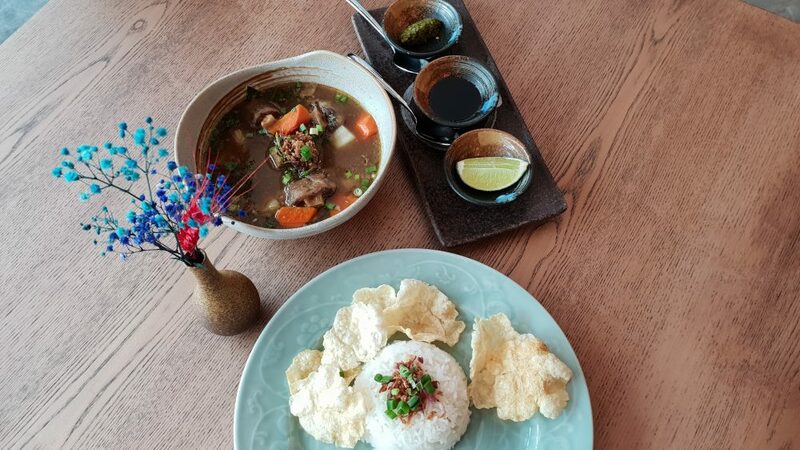 Oxtail Soup ($19) – braised for 5 hours, the meat is tender and the stew is chockful of carrots and potatoes. They serve it with kicap manis and homemade green chilli sauce. 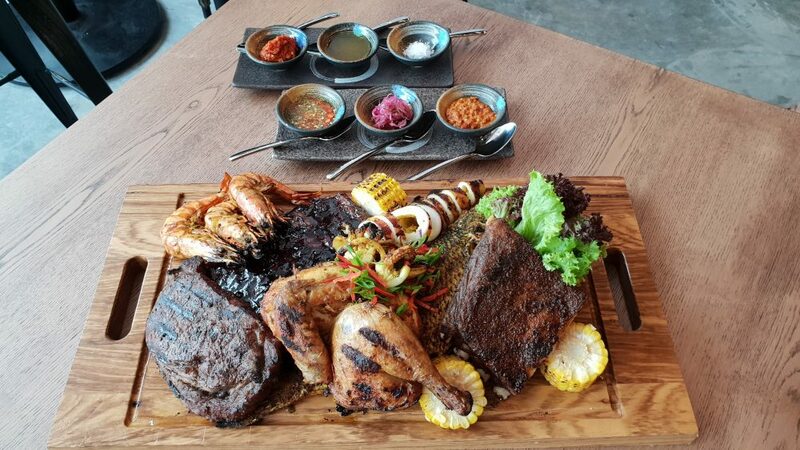 The Land part of the dish sees the Balinese Pork Ribs, the Lamb Ribs, Chicken and Beef Ribeye while the Sea portion features Squid and Grilled Fish. I didn’t manage to take a picture of the grilled fish but it’s well-cooked and tasty, just like everything else on the platter. They also serve you lots of condiments and the sambal is especially spicy and yummy. Unfortunately, I had to skip dessert – but from the sounds of it, they seem worth trying for the next time. The Klapertart ($12) which is a coconut custard with almond flakes and rum-soaked raisins, served with homemade rum-and-raisin ice cream, topped with a cheddar cheese crust? Sounds delish!